Sydney will need around 725,000 additional homes over the next 20 years to accommodate a growing and aging population. 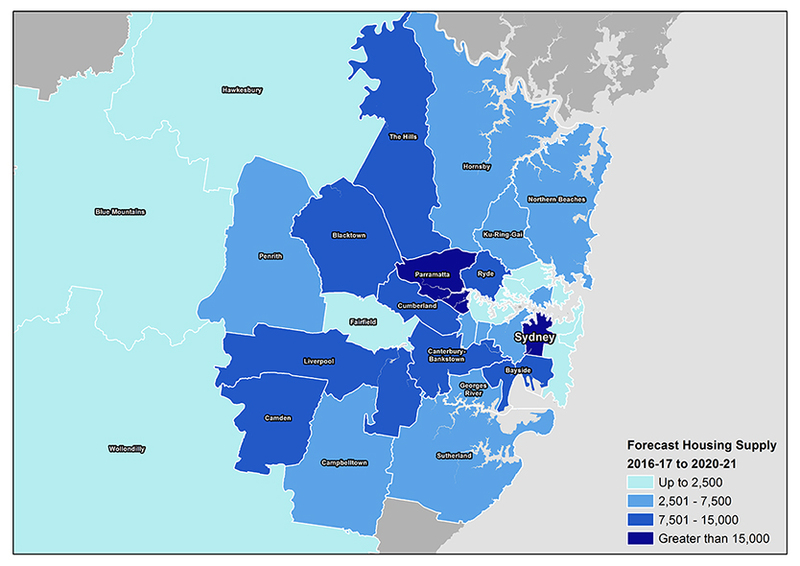 Sydney’s population is projected to grow by around 1.74 million people by 2036. The aging of the population means that even without any population growth, Sydney would still need around 140,000 additional homes due to a fall in average household size (with proportionally more ‘empty nesters’ and single person households). Housing provides shelter, well-being, and financial security, and is critical to maintaining Sydney’s status as a liveable, sustainable, and productive global city. 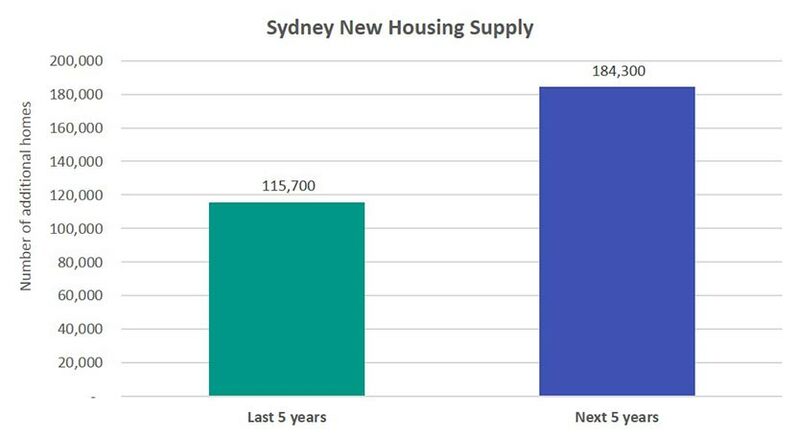 The Sydney Housing Supply Forecast provides information on where, when, and how many new homes are likely to be built. The forecasts are used across Government to inform infrastructure planning and service delivery to support new housing development. 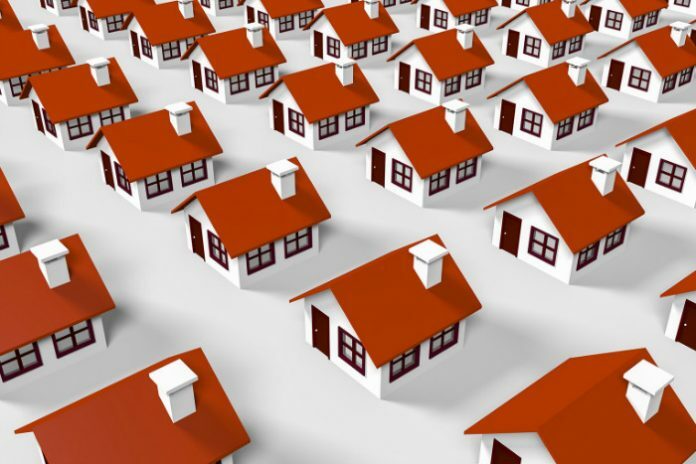 They also inform decisions on future land use zoning to ensure adequate levels of new housing supply are maintained. The forecast takes into account current residential developments that are either under construction or approved, as well as analysis of likely future development under current zoning and planning controls. The forecast also takes account of information gathered from local councils and industry. The Department forecasts the construction of over 180,000 new homes in Sydney in the next five years, based on current programs and initiatives. This is a 59 per cent increase or an extra 68,600 new homes compared with the last 5 years where 115,700 new homes were completed. This high level of new home construction comes on the back of record housing approvals and commencements, a strong economy, high levels of population growth, a booming housing market, and record low-interest rates. 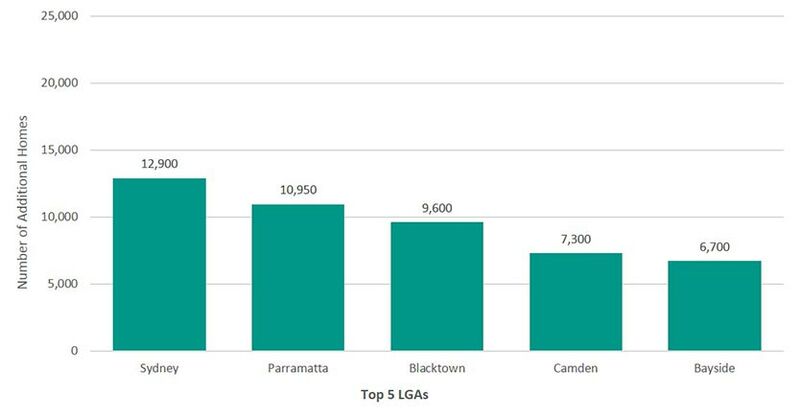 The graph below represents the five local government areas with the highest number of additional homes forecast to be built in Sydney over the next five years. 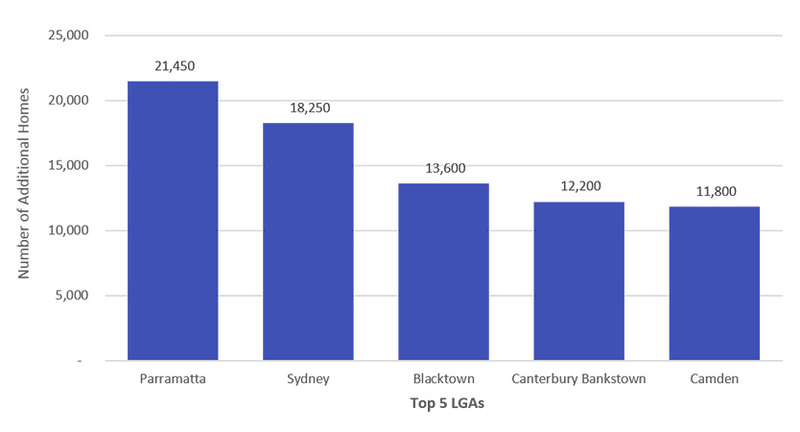 The graph below shows the five local government areas with the highest number of additional homes built over the last five years in Sydney. You can read further reports including indepth LGA reports over at the Planning NSW official website.